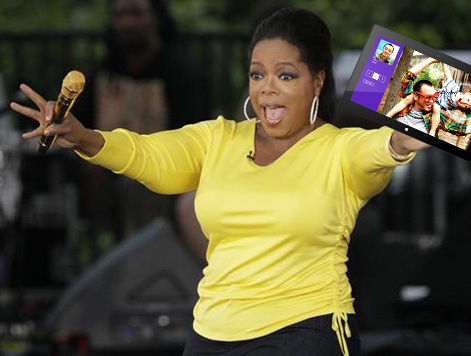 Oprah hasn’t been shy about her love for the MS Surface. In early November, she claimed that it was one of her favorite things. This morning, she tweeted that she has bought 12 for Christmas gifts. She sent that using Twitter for iPad. The Surface is on Oprah Winfrey’s list of 48 favorite things, with other gadgets such as Beats by Dre Powerbeats. As always, lists like this need to be taken with a grain of salt. Microsoft has spent $1.5 billion on Windows 8 promotion. Jessica Alba, Oprah, Gwen Stefani and others have endorsed Windows 8 and/or Windows Phone 8. Oprah’s tweet is a good opportunity to examine the state of the Twitter apps for Windows RT. Arguably, the Surface is a new product and there wasn’t a good Twitter client for the Surface when it launched. But if you look hard enough, you will find Rowi, MetroTwit and Tweetro. Twitter shut down the latter after hitting the 100,000 user-login token limit, as it was a Twitter client replicating the core experience. But Windows 8 and Windows RT apps are two different things. Windows RT only runs on ARM-based devices and doesn’t support legacy Windows apps. It remains to be confirmed whether Twitter’s app will actually run on the Surface. Even if Oprah has never used a Surface or insists on using official Twitter apps, she can still use the Twitter website — especially if she only needs to send one endorsement tweet for the Surface. And yes, the tweet would look the same even from her iPad. Now it makes her look like a sell-out.